The need for a new approach to conservation planning, delivery, and evaluation was filled through a 25-year rigorous process of developing, testing and improving practical decision-support models for conservation delivery. Further refined in 2012, the power of these tools for predicting duck abundance and productivity continues to grow. Our current planning tools combine estimations of the distribution of waterfowl as a function of wetland and landscape characteristics, with estimate of species-specific reproductive success as function of nesting effort, nest habitat selection, habitat availability and habitat-specific influences on nest survival. Find out more here. JV partners have increasing confidence that their planning models, coupled with ongoing monitoring of waterfowl populations, wetlands and land-use metrics, provide a reliable and cost-efficient approach to conservation design. The PHJV’s first conservation planning gambit in 1987, with the help of USFWS scientists in North Dakota, was to tweak a new model of mallard productivity and link it with a DU-developed computer planning tool. This allowed JV planners to play “what if” scenarios about the impacts of adding conservation programs to realistic agricultural landscapes, and they used this to help assemble an initial suite of conservation programs in each Prairie Province. Though not perfect, this was a big improvement over ad hoc planning. The cost of going to the field and assessing duck productivity everywhere – before and after PHJV treatment – would have been astronomical. But we knew that a model built only for mallards, based on data only from the Dakotas, and using wetland and land-use parameters different from those available in Canada, would not suffice for the long term. So PHJV partners launched the most ambitious scientific assessment of waterfowl production ever undertaken anywhere on the planet, the PHJV Assessment Study. 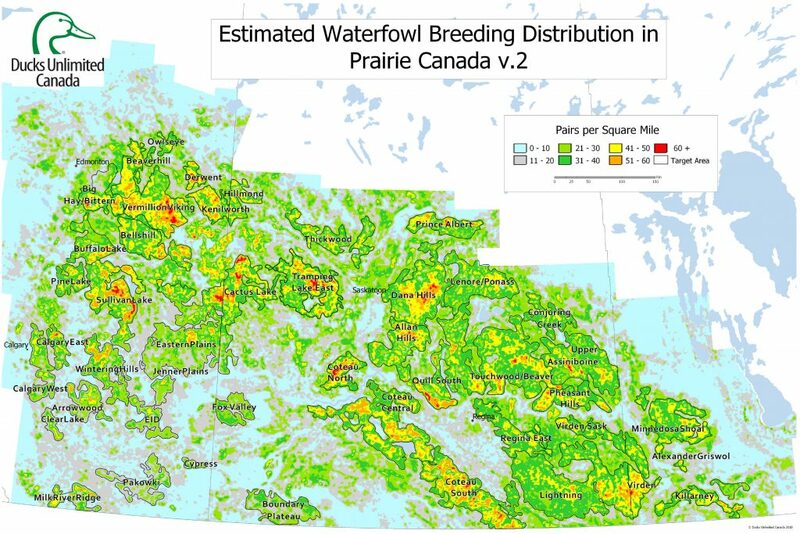 Results from that study, numerous ancillary studies, and enhanced habitat monitoring information, provided vital new information on how landscape characteristics, wetland abundance, and other factors affected the distribution and productivity of the five most common duck species on the prairies. Key results of that work, and citations of the technical papers, were summarized by Devries et al. 2004. Like all the habitat Joint Ventures, the PHJV has embraced an all-bird mandate and as new resources allow, has begun developing conservation planning tools for other species (see 2013-2020 Implementation Plan pp. 12-15, 29 and Appendices 2 and 9). The most advanced efforts include initial species distribution models for marsh birds (Appendix 9) and grassland songbirds, that include for the first time, priority habitat maps for multiple species. These products have great potential for helping direct investment of new funds for grassland birds when these can be obtained. The PHJV has embraced adaptive management by working in cycles of planning conservation programs, assessing their performance, monitoring back-ground changes in landscape and wetland conditions, adjusting conservation plans as warranted, and repeating this cycle of delivery and adaptive improvement once again. It’s a formula for steady improvement in program performance and growing confidence in the value of PHJV conservation investments. Bartzen, B. 2008. Wetland characteristics and abundance of breeding ducks in Prairie Canada. MSc thesis, University of Saskatchewan, Saskatoon, Canada. Devries et al. 2004. 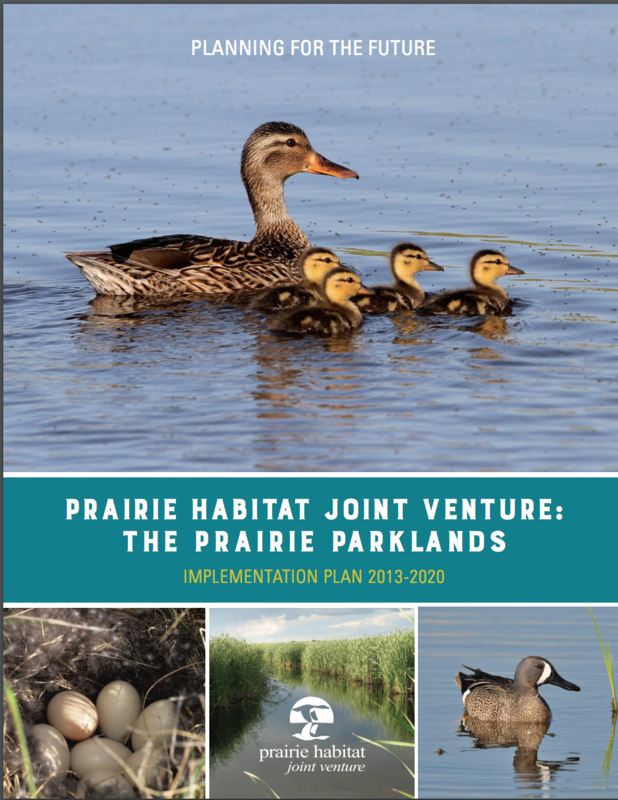 Prairie Habitat Joint Venture (PHJV) Waterfowl Habitat Goals Update: Phase 1. Devries, J. H., L.M. Armstrong, R.J. MacFarlane, L. Moats, and P.T. Thoroughgood. 2008. Waterfowl nesting in fall- seeded and spring-seeded cropland in Saskatchewan. Journal of Wildlife Management 72:1790–1797. Howerter, D. W., M. G. Anderson, J. H. Devries, B. L. Joynt, L. M. Armstrong, R. B. Emery, and T. W. Arnold. 2014. Variation in mallard vital rates in Canadian Aspen Parklands: The Prairie Habitat Joint Venture assessment. Wildlife Monographs 188. Watmough, M.D., Li Z. and Beck E.M.. 2017. Prairie Habitat Monitoring Program Canadian Prairie Wetland and Upland Status and Trends 2001-2011 in the Prairie Habitat Joint Venture Delivery Area, Prairie Habitat Joint Venture, Edmonton, Alberta, Canada. From the beginning, PHJV partners recognized the vital role that scientific evaluations could play in ensuring the effectiveness of conservation investments. The PHJV was the first Joint Venture in North America to produce a comprehensive evaluation plan (1989) and it set us on a path of adaptive management. For instance, researchers tested the efficacy of all the programs initially delivered by PHJV partners. As a result, two vital things happened: 1) some programs were expanded (e.g., wetland restorations, protection of existing prime habitat), some were scrapped (e.g., fenced dense nesting cover, spring-seeded zero-tillage), and some were modified to greater effect (e.g., planted nesting cover, delayed hay cutting); and, 2) with new information, the duck production model used for conservation planning could be dramatically improved. Another important change driven by research results, was expansion of PHJV focus areas to include more prairie grassland landscapes and not just the Aspen Parklands. Long-term avian and land-use monitoring remains essential for tracking waterfowl and habitat status and trends, and for supporting PHJV conservation planning. Together, these wetland and landcover data sets also provide vital information for large-scale PHJV program evaluations. Environment and Climate Change Canada’s (ECCC) Canadian Wildlife Service, and the United States Fish and Wildlife Service combined May breeding pair surveys provide vital data on the annual abundance and distribution of breeding waterfowl and prairie ponds (https://www.fws.gov/birds/surveys-and-data/reports-and-publications/population-status.php). For other bird species, the North American Breeding Bird Survey, begun in Prairie Canada in 1967-68 provides the most useful long-term trend information. For Canada, these annual estimates are coordinated and compiled by ECCC’s Canadian Wildlife Service (https://www.canada.ca/en/environment-climate-change/services/bird-surveys/landbird/north-american-breeding.html). Since the beginning of PHJV planning, DU Canada’s satellite wetland inventory data base has provided large-scale coverage for baseline mapping and the basis for sample-based change detection. Recent analyses of wetland loss (Implementation Plan, Fig. 10) was developed from multiple data sets. ECCC’s Canadian Wildlife Service Prairie Habitat Monitoring Program provides added detail on wetland trends and upland land use on 221 habitat monitoring transects across the three Prairie Provinces. Link coming soon. Broad scale data on land use for consolidated crop reporting districts (Rural Municipalities) are published every five years by Agriculture and Agri-Food Canada. This information has provided a key component for planning PHJV program delivery. The most recent Census of Agriculture (2016) can be accessed online from Stats Canada. Beginning in 2009, these land use data have been supplemented by annual crop mapping (with 30m pixel spatial resolution). See AAFC Annual Crop Inventory. Begun in 2002 by Environment and Climate Change Canada, Ducks Unlimited Canada, the Canadian Space Agency and the North American Wetlands Conservation Council Canada, this work is progressing across the country (http://maps.ducks.ca/cwi/). As of 2018, completed areas include much of southwestern Manitoba, southeastern and central Saskatchewan, parts of central and northern Alberta, and southern parts of the Western Boreal Forest – including many high priority PHJV conservation regions. PHJV agency scientists and their university partners have pursued dozens of studies (see Devries et al. 2004 for an early summary) designed to test specific methods of enhancing duck production, test important assumptions made in PHJV planning models, or explore novel ways of affecting conservation outcomes. As an example, using a large sample of northern pintail nests from 64 PHJV study sites between 1997-2009, Devries et al. 2018 analyzed factors affecting nest-site choice and nesting success. Factors including time of the season, annual wetness, breeding-pair density, nesting cover type and more affected breeding success. These results will be used to update and improve predictability of northern pintail nest distribution and nesting success in PHJV conservation planning models. Growing insights about the utility of fall-seeded cereals as pintail nesting cover in certain landscapes are particularly helpful. JV partners have made many scientific investments in understanding the functions and benefits of wetlands in agricultural landscapes. This information is vital for negotiations with government agencies and agricultural interests in the development of policies to protect wetlands. Among the important findings are that small prairie wetlands can play a major role in removing unwanted nutrients from watersheds and thus protect downstream water quality. They can also play a major role in slowing runoff in spring and thus dampening flooding. Improving and Testing the Prairie Hydrological Model at Smith Creek Research Basin. Under many circumstances, restoring wetlands can also contribute to removing carbon dioxide from the atmosphere. These add important economic and social values to wetlands that are of more apparent value to wildlife and recreation. There is growing evidence that for many watersheds in agricultural regions, excess nutrients (especially phosphorous) can accumulate over time. Mobilization and transport downstream of the built-up nutrient stores can be slowed by reducing movement of water off the land (e.g., Sharpley et al. 2013; Powers et al. 2016). Small wetlands play a disproportionate role in the processing of nutrients (Cheng and Basu 2017). This, in combination with the role that wetlands play in mitigating watershed runoff (e.g., Schotter et al. 2013; Dumanski et al. 2015; ), highlights the importance for conserving wetlands to help minimize movement of phosphorous and other nutrients downstream (Badiou et al. 2018). Other current PHJV-associated studies include the effects of climate variability and land use on wetland invertebrate assemblages and associated birds, resilience in prairie agroecosystems, and development of new fine-scaled (4 km2) projections for wetland distribution across the prairie pothole region for climate conditions later this century.